Blackjack has achieved a remarkable fame amongst the card players. The game has attained a considerable attention since the time it was invented in the 15th century. In the present scenario, there are multiple variations of the game that are popular amongst the casino lovers all over the world. Over the years, the game has developed very much and there are many different variations of the game available according to different geographical locations. Blackjack Atlantic by NextGen Gaming is one of the most popular variations of the standard blackjack game that has attracted many players. NextGen Gaming has developed this game in a manner that it retains most of the rules of the standard variant of the game. It has introduced some of the very interesting features that make it challenging as well as entertaining at the same time. The game is perfect for those who have a low bankroll and are looking to entertain themselves rather than earning money through a game. Blackjack Atlantic City HS is a Single hand blackjack game with top class graphics and fine background music that sets you in the mood of gambling instantly. Below are some of the important aspects of the game along with its rules and payouts. At bCasino, we are committed to providing our players an exceptional casino gaming atmosphere. The casino is equipped with the latest software and has a collection of games that is a dream for every casino player out there. This vast collection of games combined with bCasino’s professional customer support, easy payment methods, and mobile compatible website make it one of the most popular casinos in the United Kingdom. Playing Blackjack Atlantic City SH at bCasino has its set of advantages such as up to date software, lucrative promotional bonus, and minimum withdrawal time. Blackjack Atlantic City SH has been developed by NextGen Gaming that enjoys a reputed position in the casino software providing companies. The casino software development company has provided some of the most popular titles that are extremely famous among players. Since the game is developed by one of the finest developing companies in the industry, players can expect high-quality graphics, crisp and clear background music. Suitable for all the low rollers, the game bears a strong resemblance to the standard blackjack game except the developer has tweaked the game a bit to make it further interesting than its standard version. The game still revolves around the objective of achieving the value of cards to 21 before the dealer achieves it. You can also win this game if the dealer exceeds the value of 21. The major difference between the classic blackjack and Blackjack Atlantic City SH is that, in this game, the players are allowed to split their cards multiple times except for the aces. This is not allowed in the standard variation of the game. Now that you can split the cards multiple times, it requires extra strategy and thinking process to achieve the magical number of 21, making the game more exciting. Blackjack Atlantic City SH is a product of NextGen Gaming which is a reputed casino game developing industry and has been in this genre for a very long time. The game’s interface has been designed in such a manner that it seems like the developers were trying to imitate a brick and mortar casino. For the fans of physical casinos, the game would be a homecoming. On the game page, you will be greeted by the title of the game along with the company’s name at first. As the game will load, you see that the interface has been dominated by the green color which shows that the game developers were inspired from the land-based casinos. The interface looks clean and almost self-explanatory in the first look. On the left side of the screen, you will see minimum and maximum bets written as 1 and 100 respectively. Below the bets, you will find a button titled ‘Game Rules. Clicking on this button will open the rules of the games in a new window. At the centre of the screen, you will find the Blackjack Atlantic City’s logo along with some of the basic rules of the game such as “Blackjack pays 3 to 2,” “Dealer Must Draw To 16 and Stand On all 17” and “Insurance Pays 2 to 1” written in the bold. You will also see the deck of the card around the rules. When you look at the bottom of the screen, you will find a ‘Bet Here’ button which plays a major role in the game as players place their buttons by clicking it. Below the button are the chips that are used in betting and at the very bottom of the screen, you will find a counter with balance in your amount, total stake and winning amount being displayed and updated in the real time. On the right-bottom of the screen, you will find a wrench shaped button that is meant for customizing the game related settings Clicking on this buttons opens up a menu from where you can adjust settings related to game speed, audio, color, and language. You have the complete control over the game as you can choose from different options available here. If you have played a standard blackjack game at any online casino then you would get a grip on the rules without any issue. In the Blackjack Atlantic City SH, your aim is to beat the dealer’s hand without exceeding the value of 21. If the total of your first two cards is 21 then it would be considered as a blackjack provided you have any 10 value card and an ace. The game is played with the 8 decks of 52 cards each. Jokers are not considered as the part of the game. The cards are shuffled before each round that makes it impossible for the players and dealers to count the cards. At the beginning, a player has to choose his wager. After choosing the wager, cards are dealt. As soon as the cards are dealt, the participating player checks whether he has a blackjack or not. Simply saying, it is checked whether the cards held by the player consists of a ten or an ace. 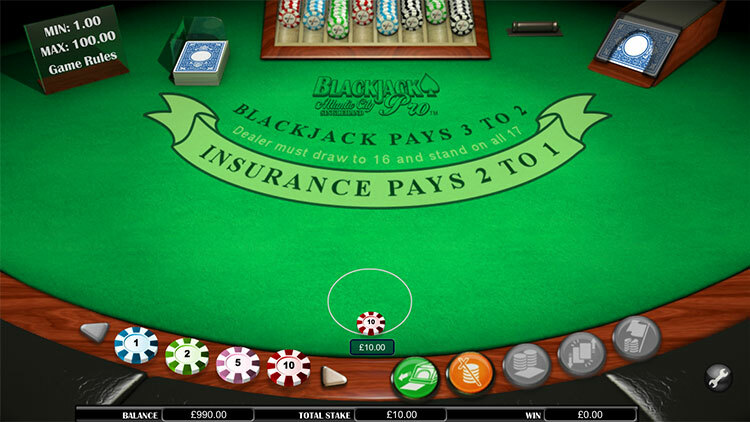 In the game, the players have the option of buying insurance in order to secure his bet against the dealer’s blackjack. At the beginning of the card game, two cards are dealt to the player and the dealer. Out of the two cards dealt to the dealer, one card is face up and the other is face down. Therefore, the player playing the game can view the card that is face up. All the cards are valued at 10. The value of aces depends on the advantage acquired by the player. Ian ace can hold either 1 or 10 value as per the advantage. The remaining cards that are numbered between 2 and 10 carry their own face value. The dealer’s blackjack supersedes all the bets except eh player’s blackjack. Such a situation in the game is called a “Push”. The game of Blackjack Atlantic City HS does not have any bonus round or jackpot. The payouts in the game are pretty simple. Blackjack pays 3 to 2, normal winning hand pays 2 to 1, whereas an Insurance bet pays 2 to 1. Split happens when the first two cards dealt to the player or the dealer has the same value. When a split happens, the bet equal to your original bet is placed on each hand. Players are allowed to split hands only once and while splitting aces, only one card is dealt to each ace. If a card valued at 10 is dealt to either ace, the hand is considered as a blackjack. The game offers the feature of double down at the start of the betting for that particular hand. The game allows double down on split hands as well. Insurance is applicable only when the face-up card dealt to the dealer is an ace. In the insurance, another bet equal to the half the value of your initial bet is placed before the dealer goes for checking blackjack. Surrender can be used on any hand. It is applicable after initial cards are dealt and before the game on each hand begins. 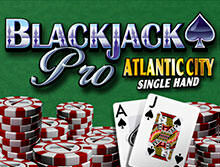 Blackjack Atlantic City SH is a fairly easy yet entertaining game of cards. Since you are allowed to split your cards multiple times, there can be huge wager amounts. Therefore, you need to apply the best strategy to win the game before the dealer achieves the target of 21.